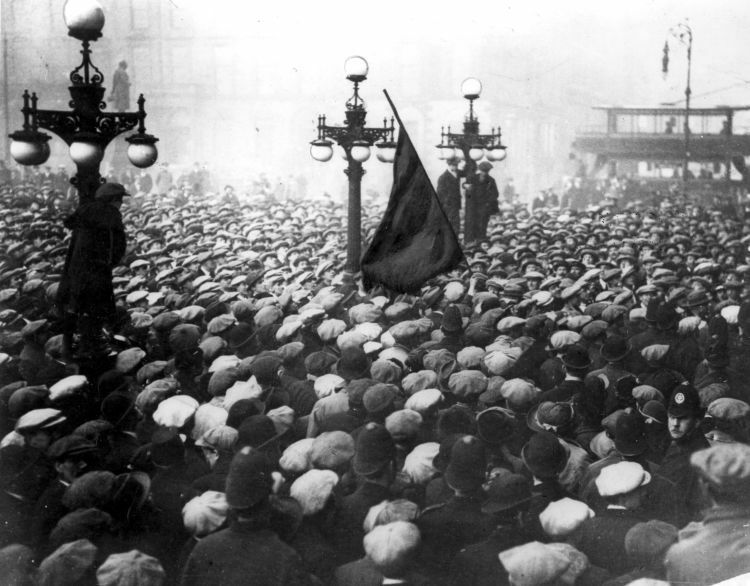 A red flag is raised above the crowd in George Square, Glasgow, 31st January, 1919. The year started with a tragedy. On Hogmanay 1918, HMS Iolaire put out from Kyle of Lochalsh heading for Stornoway on the Isle of Lewis. On board were almost 300 men, predominantly Royal Navy sailors, coming home from the war. In the early hours of New Year’s Day 1919 the Iolaire struck notorious rocks a mile outside Stornoway Harbour. Valiant efforts saved many of the men on board but more than 200 drowned as the ship went down. It was a heart-breaking blow after four long years of war. People were exhausted in 1919. The war was over but the peace had yet to be won. Promises had been made of a land fit for heroes but there were few signs this was about to arrive any time soon. After the strain and losses of the war, another blow was dealt when the influenza pandemic swept round the world. Between May 1918 and the spring of 1919, Glasgow alone experienced three outbreaks which caused 4,000 deaths. Many of those were of children under five, who were particularly susceptible. Around the world, millions died of the Spanish Flu. Yet it is almost a forgotten tragedy. After so many deaths during the previous four years, perhaps people simply could not absorb any more grief. In politics, the Representation of the People Act of 1918 had given the vote to men over 21 and women over 30. Despite this hard-won and so long awaited extension to the franchise, the post-war election disappointed many. There was a widespread view that the poll had been rushed and nothing much had changed. As Davie Kirkwood, one of Red Clydeside’s leaders, put it: ‘In that election the Socialists went down like ninepins. The country had only one hero, Lloyd George, and only one object: “Make the Germans pay.” ’ The Welsh Wizard had now become The Man Who Won The War. A new coalition government was formed. Although the Conservatives under Andrew Bonar Law had more seats, Lloyd George’s popularity with so many voters meant that he remained prime minister. The Labour Party had returned 57 MPs to Westminster, the greatest number yet, but they had little power in this new parliament. Frustration mounted as the wartime economy slammed on the brakes. There was no longer the need to go hell for leather on munitions and the Clyde’s order books were beginning to look sparse. Thousands of demobbed servicemen were flooding into a labour market where there soon wasn’t enough work to go round. The Scottish Trade Union Congress, Glasgow Trades and Labour Council and other trade unionists came up with an idea. Reducing industry’s working week from 54 to 40 hours would allow what work there was to be shared out more fairly. Resistance to this idea from employers, the government and some unions led to calls for industrial action. The dispute became known as the 40 Hours Strike. On Sunday, 26 January 1919, 10,000 people, some waving red flags, marched from St Andrew’s Halls to the City Chambers. In their report the next day in which they gave their readers that information, the Evening Times quoted one of the speakers who addressed the marchers in George Square. Mr Cameron of the Discharged Soldiers’ Federation said his organisation was ‘backing the workers this time and looked for the workers to back them. They had fought for their country and they now wanted to own it.’ The next day St Andrew’s Halls was again the focus. Three thousand people attended the meeting where the strike was officially called. Over the next few days the protest gathered momentum. Workers at the Port Dundas and Pinkston power stations were among those who came out, cutting electricity supplies throughout Glasgow. They agreed to keep the lights on in the city’s hospitals and streets and to keep Glasgow and their fellow strikers moving by keeping the trams running. The three firebrands in question were Manny Shinwell, Davie Kirkwood and Neil MacLean. The Times noted that Manny Shinwell ‘is described as a Polish Jew.’ In fact, he was born to Jewish parents in the East End of London, moved to Glasgow with them and became an adopted Glaswegian. Formerly of Singer’s, Neil MacLean was one of the 26 Scottish Labour MPs elected to parliament in the previous month’s poll. ‘These are the men who have challenged the Government,’ wrote The Times disapprovingly. On Wednesday, 29 January a committee of strikers asked Glasgow’s Lord Provost to intervene on their behalf with the government. James Stewart said he would do what he could and asked the committee to come back to see him on the Friday. They brought a few friends with them. Davie Kirkwood described George Square as ‘black with men’. Some say 60,000 people gathered in the centre of Glasgow that Friday. Other estimates put the number as high as 100,000. The famous photograph of the event is the image of Red Clydeside. The unknown press photographer who shot it certainly framed a surging mass of humanity, all crammed in together. Apart from the policeman turning to look at the photographer, all eyes are on on the City Chambers. If Scotland ever really did come close to revolution, this is the favoured moment. Some men have shinned up the ornate lamp posts outside the City Chambers, Glasgow’s seat of municipal power. Red flags have been unfurled. Manny Shinwell and Davie Kirkwood were to the fore, along with Wilie Gallacher of the Shop Stewards’ Movement. John Maclean was not in Glasgow, fulfilling speaking engagements and attending political meetings in Cumberland, Manchester and London. Winston Churchill was now Secretary of State for War. The day before Bloody Friday, the Evening Times reported what he had to say about the 40 hours strike. The present situation in Glasgow had been brewing for a long time. The disaffected were in a minority, and, in his opinion, there would have to be a conflict to clear the air. We should be careful to have plenty of provocation before taking strong measures. By going gently at first we should get the support we wanted from the nation, and then troops could be used more effectively. The moment for their use had not yet arrived. In the meantime the Defence of the Realm Act [DORA] was still in force, and some of the leaders of the revolt should be seized. It’s no wonder the government was nervous of Glasgow’s strikers. Not only had Red Clydeside earned a powerful reputation for its readiness to confront authority, what was going on in Europe must have sent a shiver down the spine. The shock waves pulsing out from Russia’s October Revolution of not much more than a year before were still being felt. Even socialists and Communists who had welcomed that with such jubiliation had been astonished by how quickly and completely the Tsar and the apparatus and institutions of Imperial Russia had been swept away. The German Kaiser had abdicated at the end of the war and Germany had just experienced its short-lived revolution. That ended in spectacular failure and death for its leaders, who included Karl Liebknecht and Rosa Luxemburg. On 15 January 1919, two weeks before the Battle of George Square, they were taken from the Adlon Hotel in Berlin and executed without trial. That the next European revolution might erupt on Red Clydeside could not be ruled out. Yet few of the strikers seemed to have thought that. Harry McShane of the Clyde Workers Committee said, ‘We didn’t regard the Forty Hours Strike as a revolution. We saw it more as the beginning of things.’ Neil MacLean, Shinwell, Kirkwood and Harry Hopkins of the Amalgamated Society of Engineers went into the City Chambers to meet the Lord Provost and hear from him what the government had said. While they were in there, around noon, the men and women who’d made sure they arrived early in George Square began to get restive. The demonstrators responded with stones and bottles, taking those from a lorry which had got stuck in North Frederick Street. Sheriff Mackenzie came out of the City Chambers, saw what was going on, and decided to read the Riot Act, a copy of which he had conveniently brought with him, ordering the crowd to disperse. It was the first time in 50 years it had been read and the last time it ever was read. Sheriff Mackenzie wasn’t very far into it before his copy of the act was plucked from his hand by one of the strikers but he managed to complete the words from memory. Tramcars had become marooned in the ocean of people. One female driver was stopped by men jumping up onto her platform and making off with the reversing handle. Afraid because of all the bottles that were flying about and because the windows of her car had been smashed, Mary Beattie left the tram. There’s plenty of eye-witness evidence that Davie Kirkwood rushed out of the City Chambers and into George Square when he heard the noise of the disturbance and was almost immediately knocked unconscious by a police baton. A photograph taken at the time confirms this. 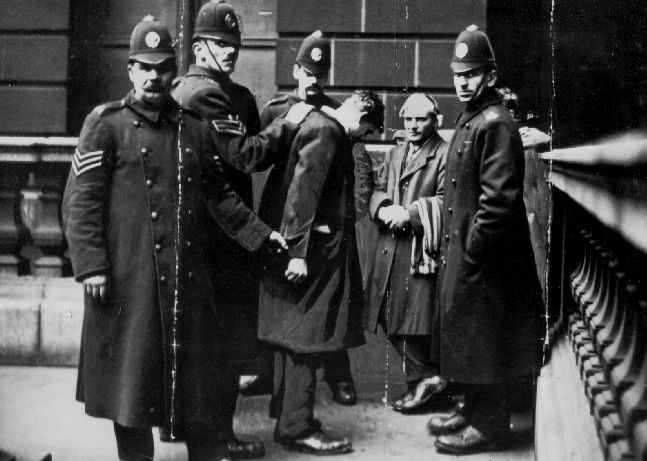 Willie Gallacher was also injured and he, Kirkwood and Shinwell were arrested. 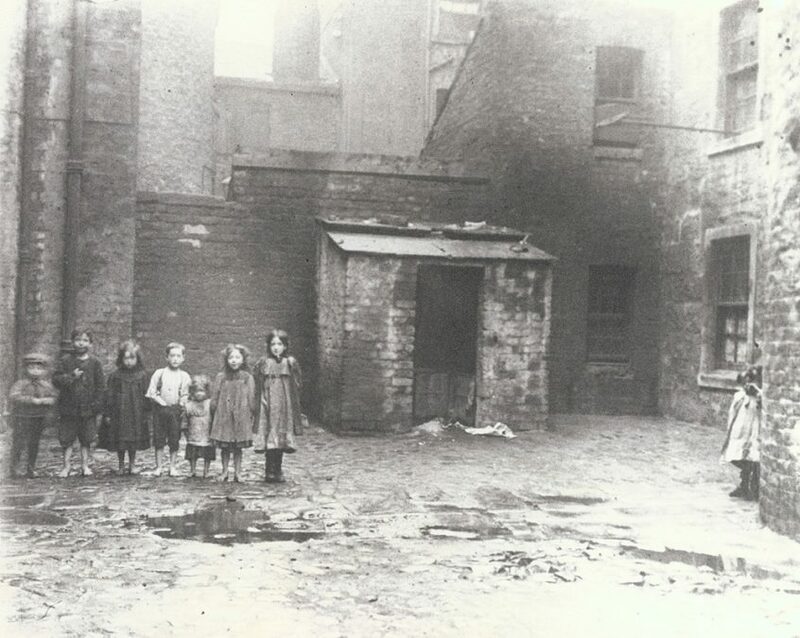 The fighting continued, spreading up into North Frederick Street, Cathedral Street and later developing into running battles down to the river at Clyde Street and along as far as Glasgow Green. Nobody died but both demonstrators and policemen were injured. Official figures put the wounded at 34 strikers and 19 policemen. Given the numbers in the square, this would seem to indicate most people in the huge crowd were not involved in the fighting. The Scotsman reported on some police officers who were. Sergeant John Caskie described how an inspector and himself were pinned up against the wall while the crowd threw missiles at them. Witness had his helmet bashed and received a severe blow with half a brick on the shoulder. The inspector was hit by a number of stones. They dodged the heavy ones and submitted to the lighter ones. (Laughter.) The attack on the inspector and himself would last about five or ten minutes. Constable Campbell Smart, who stated that he was hit on the head, hands, and feet, declared that while he had had some unpleasant experiences in France, where he had served in the Army up to the point of the Armistice, there was nothing worse than they had had in Cathedral Street. Glasgow’s Evening News was first with the report on the day, carrying it that night. In the tense hours and days which followed, those army tanks which had been dispatched north rolled through the streets of Glasgow in a show of strength designed to impress and subdue the troublesome natives. It’s part of the romance of the story that the troops who marched in with the tanks were young English conscripts, it being thought too risky to deploy the Scottish troops in Maryhill Barracks. The chances of their changing sides was too high. The Glasgow Herald was at least more honest about the fear the Battle of George Square struck into the hearts of the city’s Establishment. John Wheatley might have stated quite clearly in 1918 that the Independent Labour Party rejected revolution. ‘The people of this country may have socialism when they consider it worth their vote.’ Not convinced, the Glasgow Herald declared the people who had caused the trouble in the square were Bolsheviks. Bolsheviks, sometimes Bolshevists, were entering popular culture as the villains of the piece. Glasgow 1919, The Story of the 40 Hours Strike includes among its press cuttings and Harry McShane’s account of Bloody Friday and what led up to it an episode of a serial which appeared in the Glasgow Herald on 8 February 1919, one week later. The dramatic drawing which accompanies the serial shows an ‘infuriated Bolshevist’ pointing a gun at Derek Clyde, the famous detective. ‘I mean to kill you! I shrink from nothing that is my duty. It will be no crime to destroy one who is the tool of tyrants and oppressors.’ Adding to the mix that dash of casual anti-Semitism so common at the time, the story also includes ‘a Jew named Finkelstein’. By Sunday, 2 February, The Times’s special correspondent was reporting that the troops on guard in Glasgow seemed to be teaching the strikers a lesson, as there were ‘signs of returning reason. The futility of violence in the face of machines guns and rifles has been realised.’ Those machine guns were mounted on top of the buildings around George Square, with a howitzer in the City Chambers. Would Lord Provost James Stewart really have been prepared to sanction the mowing-down of thousands of Glaswegians, his fellow citizens? The Bulletin showed two soldiers in tin helmets and with fixed bayonets at the power stations, describing them as ‘this formidable guard – equal in strength to the guard at a bridge-end on the Rhine.’ Although it has to be said that they and many of the soldiers in the photographs of the aftermath of Bloody Friday do look very young. On Monday, 10 February the 40 Hours Strike was called off, with a recommendation that everyone should go back to work on Wednesday, 12 February. The Glasgow Herald was unable to resist a de haut en bas wagging finger, printing a ‘WARNING TO REVOLUTIONARIES’. The strike can hardly be said to have reached an official termination; it died a natural death because it had no moral or financial support, because so very few people wished it to live any longer, and because its continued existence was an obvious anachronism in a community which never took it seriously as a Labour movement, but which objected to it emphatically as a symptom of incipient revolutionary tendencies wholly foreign to the good sense and the political and social beliefs of the people. The twelve men tried in Edinburgh in April 1919 were charged with ‘forming part of a riotous mob to hold up the traffic in the Square and adjoining streets, to overawe and intimidate the police force on duty there, to forcibly take possession of the Municipal Buildings and the North British Station Hotel.’ Five of the defendants, including Kirkwood, Gallacher, Shinwell and Harry Hopkins of the Amalgamated Society of Engineers faced additional charges of inciting of mob ‘of 20,000 or thereby riotous and evilly disposed persons’. One of the witnesses for the defence was Rosslyn Mitchell. As a town councillor, he had been on a balcony in the City Chambers watching the crowd, giving him an excellent view of what was going on. He thought the police had initially drawn their batons to push the crowd back to clear the way for a tramcar to pass and it had escalated from there. …some of the police poked the crowd. If the crowd had been determined to move forward with a vicious intent, the cars would have toppled over, and there would have been massacre. To his astonishment, the police charged the crowd at the double. In his view, there was no reason for that charge. After the charge the crowd took turf and daffodil bulbs from the plots in the square, and stones, and threw them. There was another baton charge, in which men were struck down indiscriminately, and a great many people were injured. It was some time after the second baton charge that the bottle-throwing began. After the first baton charge the attitude of the crowd was pretty ugly. There was no evidence of the crowd to do mischief that day. In his final summing up, the Lord Justice Clerk told the jury he was ‘sure they were tired of the case, but he thought it right to say that in his judgment the case had not occupied any more time than it ought to have occupied.’ Nor did his lordship see much significance in the red flag having been carried by the strikers on the Monday before Bloody Friday: ‘… he was not sure he knew what the red flag meant. But whatever it meant, it had the capacity, apparently, of exciting paroxysms of indignation and derision in some quarters, and exciting enthusiasm beyond bounds in others.’ The crowd which had gathered in George Square had done so perfectly legitimately in order to hear from the Lord Provost what the Prime Minister had said. Be that as it may, rioting or inciting other people to riot was against the law. Eight of the defendants were acquitted, including Davie Kirkwood. That he had been struck by a police baton and there was a photograph of him lying concussed on the pavement had earned him a lot of sympathy. James Murray and William McCartney were sentenced to three months in prison, as was Willie Gallacher. This was despite the jury recommending leniency in his case, as he had tried to get people to disperse peacefully. Manny Shinwell was given a sentence of five months. The 40-hour week didn’t come until the Second World War, although after the strike hours were reduced from 54 to 47. The biggest difference that made was to start times, meaning men and women no longer had to be at the yard or factory gates for six o’clock. That had always been a killer. 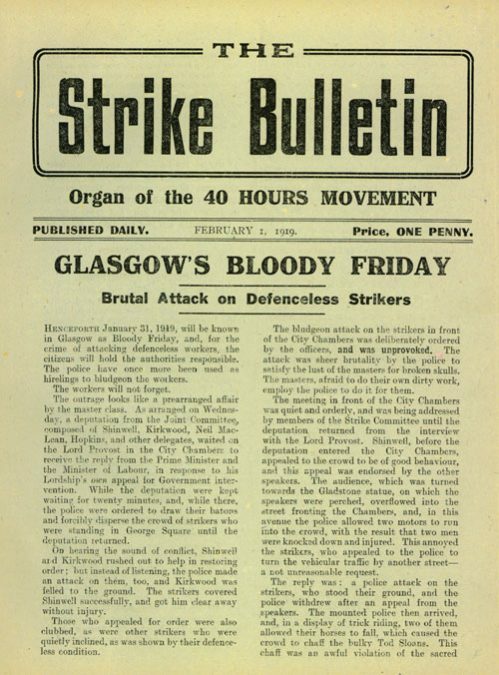 On 1 February, The Strike Bulletin gave what happened in George Square the name it’s been known by ever since. ‘Henceforth January 31, 1919, will be known to Glasgow as Bloody Friday, and, for the crime of attacking defenceless workers, the citizens will hold the authorities responsible. 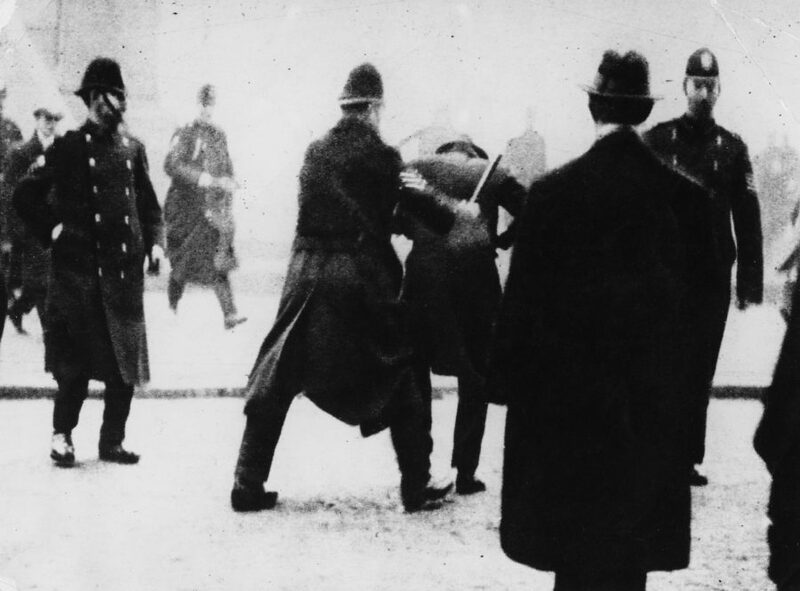 The police have once more been used as hirelings to bludgeon the workers. The workers will not forget.’ The news-sheet also urged strikers to ‘keep cheery.’ It was a very Scottish affair, this revolution that never was. The above is an excerpt from Maggie Craig’s When the Clyde Ran Red, which can be purchased here from Birlinn Books.